Every day I get requests from people who want to join our organization, but after reviewing their background, many are turned away. In reviewing resumes, only 1 out of 25 is accepted; not everyone can be members in our organization. Keeping this in mind, I’d like to talk about your active participation in our organization and remind you of your responsibilities as a member. We are a unique organization of clergy and investigators who work together in this ministry of exorcism. In helping the many people who may need our services, it is your responsibility to tell people in your cities who you are and what you do for the Order of Exorcists. 1. All members, both clergy and investigators, must show the public what organization you are affiliated with by adding “SOSM” behind your name. This stands for Sacred Order of Saint Michael, and shows you are a member in the Order of Exorcists. 2. You must promote your services to the public, showing your availability for anyone in need of your services. If you don’t have a Facebook account I’d like to encourage you to get one. It’s free and may be the best way to get the word out in what you do. 3. If you don’t have a website you should get one. If you have a website, please send a link to your website to our Media Online Director, Emily Andros, at emily@mdept.com,l so we can link it to our website. If you do not have one, we are preparing a “member’s website” that you will be able to use free-of-charge, in the near future. You will be notified when the members website is ready and at that time you’ll receive instructions on how to set up your free website. 4. Make sure to use our “logo – Order of Exorcists“ somewhere on your website to show that you are affiliated with us; this is another way to get the word out. We have created a special “artwork” page for you where you can download the Order of Exorcists Logo in a variety of different sizes and resolutions. Please click on the link above to be taken directly to that members only page. Our ministry of exorcism is real and so are the people who seek us for help. I need all of you to help me help the many. If you only have two or three members in your team or no members at all, you must start recruiting. The ideal Investigation & Assessment team should have six or more investigators. Use your computer and search on the Internet for “Christian” paranormal investigation groups in your area. Tell them who you are and if they would be interested in assisting you in demonic investigation. If you have a website already please send your link to your site to our Media Online Director (as instructed above). Make sure when you have a website online, that you link it to www.orderofexorcists.com and show our logo somewhere on your main page (see link above to get logo artwork). If you do not have a website, we are preparing an “easy to edit” WordPress website for all our members to use free-of-charge – and it will be ready soon. We will notify you when the site files are ready to use AND send you instructions on how to set up a web address and how to upload and edit the website files. We can only help if the public knows we exist. There are many websites that will give free advertising by doing a “link exchange”. If and when you get your Facebook account, please create a page showing what you do and that you’re affiliated with our organization as well as showing your availability for services in your city. If you work the model correctly, people in your city with demonic issues will contact you directly. To be fully active in our ministry of exorcism you must be available when needed and know both the “Model” and “Process”. 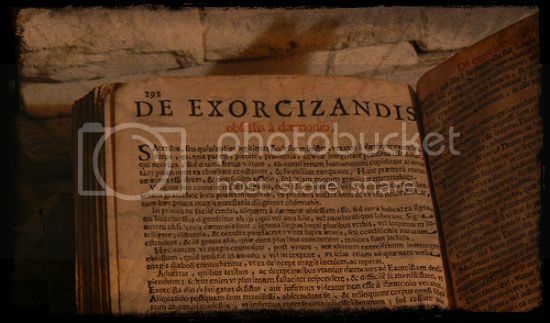 Our strict privacy rules prohibit us from showing exorcism photos belonging to our clients.